Noughi, N., Hanenberg, S. & Cleve, A., 2017, (Accepté/sous presse) Proceedings of the International Workshop on Information Assurance. Mens, K., Cardozo, N., Dumas, B. 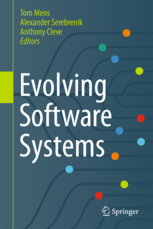 & Cleve, A., 2017, Post-proceedings of the 9th Seminar on Advanced Techniques and Tools for Software Evolution (SATToSE 2016). CEUR-WS.org, Vol 1791. p. 5-16 (CEUR Workshop Proceedings). Bacchelli, A., Mocci, A., Cleve, A. & Lanza, M., 2017, (Accepté/sous presse) Dans : Science of Computer Programming.